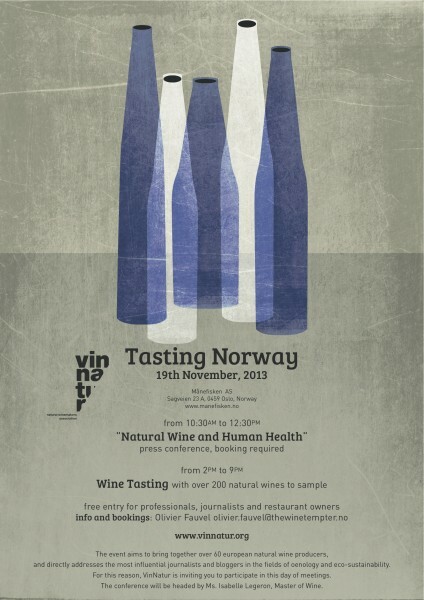 On Tuesday, 19th November, sixty winemakers from Italy, France, Spain and Slovenia will meet in the exhibition spaces of the Manefisken AS for a wine tasting from, 1.30 pm to 9.00 pm. Here below you can find the complete programme. – Isabelle Legeron, Master of Wine and organizer of “Raw, The Artisan Wine Fair”, has always been a promoter of wine produced by small winemakers, artisans who follow the idea of environmental sustainability in their work. She will introduce the conference and illustrate the reasons for producing natural wine, trying to make the subject clear; she will be free for questions and for the following debate. – Angiolino Maule, president and founder of VinNatur, will argument the necessity for creating an association formed by people who look forward and toward the youths; an association which may be the pulsating heart of new ideas and prospects for small firms which want to be visible in the market; all these are aspects needed to inform and guarantee the customers. – Dr. Laura di Renzo e Dr. Alberto Carraro (University Tor Vergata, Rome) will present the “VinSalut” project. The aim of the project is the study, by means of nutritional analyses, of the role of wine in human health. Not all wines are identical, not only for the colour, the flavour or the taste, but also for the effects each one has on the health. Some effects are negative and are often caused by the presence of ethanol, sulphites or heavy metals; some effects are good thanks to the presence of polyphenols which have antioxidant characteristics. Two main factors have been taken into account in the analyses: the differences between the conventional and the virtuous productive techniques, e.g. the adhesion to the biological and biodynamic cultivation; and the abandoning of the use of sulphur dioxides and the like. Certifiable results already exist and, in 2013, also VinNatur has entered the project to certify how this productive method may confirm the nutritional and health advantages of wine. – Dr. Diego Tomasi, member of the CRA (Council for the Agricultural Research and sperimentation) from Conegliano Veneto (Treviso), and partner of the “VinSalut” project, will discuss the improving techniques which permit to obtain higher nutritional values from wine. He has contributed to the identification of models of interventions in the vineyard which were so far limited to experimental experiences. Some examples are less invasive pruning, the reduction or the suspension of fertilizers, the elimination of pesticides (also copper and sulphur) and the use of alternative products coming from plants which are on approval. 12.30 am: End of the conference and buffet lunch for the participants. 1.30 pm: Opening of the free tasting area with a table for each producer. 9.00 pm: Closing of the tasting area.